Dir. Benjamin Chapin, 1917, U.S.
A thought: in D. W. Griffith’s The Birth of a Nation (1915), when Raoul Walsh, in the role of John Wilkes Booth, discharged a stage pistol behind the ear of actor Joseph Henabery, playing President Abraham Lincoln, the cast and crew of that film were in closer historical proximity to the death of Lincoln than we stand today to the rash of assassinations that marked the 1960s. The American frontier was officially closed in 1890, a few years before Thomas Edison opened his first film studio, but there was still something of the smell of the prairie and pioneer life to which Lincoln had been born in the early years of cinema, not yet fenced in. This feeling for that bygone world of freshwater creeks and tilled fields and as-yet-uncleared woods is one of the chief inducements recommending The Lincoln Cycle, consisting of ten two-reel episodes whose direction is credited to their star Benjamin Chapin, who plays both the adult Honest Abe and Abe’s male forebears, and who produced the entire pageant through his own independent Charter Features Corp.; he also provided the facilities for the shoot at his Benjamin Chapin Studio in Ridgefield Park, New Jersey, rented especially for this purpose in 1916. I say “credited” because Chapin allowed no other names, including those of his co-stars, to be attached to the Cycle, though the filmmaker John M. Stahl would as early as 1917 make a convincing claim that he had done most of the important behind-the-camera work on the series; when a restoration of The Lincoln Cycle—all save the eighth and ninth episodes, lost to history—appeared as one of the centerpieces of last year’s Pordenone Silent Film Festival, it was as part of a program compiling Stahl’s existent silent films. Chapin was in no position to protest Stahl’s ongoing claims, having died at age 45 of tuberculosis in the Loomis sanitarium of Liberty, New York, during the summer of 1918, his great work having at that point only followed Lincoln’s life up to 1863. We may accept that Chapin delegated direction duties to Stahl—Charter Features indeed placed a “wanted director” ad in Moving Picture World magazine, and many of the personnel on The Lincoln Cycle would go on to work with Stahl again—and that the architect of such unsurpassed studio era melodramas as Back Street (1932), Only Yesterday (1933), and Imitation of Life (1934) is responsible for the pictorial and emotional qualities of the work, but even still it needs still be said that Chapin was the driving force behind the series’ production. As with Griffith’s film, The Lincoln Cycle combines the historical sweep of a nationwide crisis with a sense of family affair intimacy. Where Griffith’s film has the story of the War Between the States told through the respective fates of two clans, the Northern Stonemans and the Southern Camerons, Chapin’s (or Stahl’s…) serial narrative makes Gentryville, both in boyhood memory and in the “present day” of the 1860s, into a microcosm of the divided nation. The central rivalry is between the Lincolns—father Tom (Chapin), mother Nancy (Madelyn Clare), sister Sarah, and young Abe, played as a boy by one Charlie Jackson—and another local clan, the father and son duo the Carters, who enjoy a higher standard of living than their neighbors in patched and torn clothes, but display a threadbare moral fiber. In the Cycle’s first chapter, “My Mother,” young Abe promises his dying mother that he will not brawl with his contemporary and archenemy, Huck Carter, any longer. In the fourth, “My First Jury,” he breaks his promise. This happens shortly after Abe has succeeded in defending, before a makeshift court of kids and farm animals, a Black neighborhood boy, Tom, from Huck, who has accused Tom of stealing a chicken from his family—which indeed he has done, though Abe argues that the chicken was first stolen from Tom’s family, a pretty handy summation of the dubiousness of property claims in these United States. He is caught in the act of brawling by a preacher, one Rev. David Elkin, who has come to Gentryville at Abe’s request to pray over his mother’s rude and unconsecrated grave; Elkin is nearly driven back home in disgust when he comes across the boys scrapping, but his hard heart melts when he sees the lad in private and earnest entreaties on the soil of his mother’s resting place. One kind turn deserves another: years later, in fifth episode “Tender Memories,” after the elderly Elkin’s son has joined the Confederacy, been captured, and been slated to hang, Lincoln will commute the sentence in tribute to this long-ago act of mercy. And who should have recruited the still-beardless Elkin, exposing him to this brush with death? Why none other than Huck Carter, of course, as rotten a man as he was a child. While by no means operating on the scale of Griffith, Chapin and company manage some piquant scenes of war and its aftermath in The Lincoln Cycle: heaps of bodies stacked after a study of Mathew Brady, or a woodland skirmish with Indians in the final completed episode, “Under the Stars,” which returns to the time of Boone to record the death of Lincoln’s fabled grandfather. Even plunged into the crucible of war, though, the reflective character of Lincoln remains somewhat unstuck in time, as when an encounter with a soldier erecting a rude cross over the grave of a friend sends Abe’s mind casting back to the death of his mother—and there is something quite touching about the shift of scale here, the idea of a Great Man in the midst of righteous struggle who remains preoccupied with the memory of this rankling private hurt, a wound that will not close. It is when dwelling on this loss that The Lincoln Cycle comes closest to touching a hidden tender spot of its subject, Lincoln’s ineradicable melancholy, reflected extensively in his own private correspondence and poetry, which includes a somber lyrical account of revisiting the scene of boyhood, “My Childhood’s Home I See Again,” a piece including such lines as “I range the fields with pensive tread/ And pace the hollow rooms/ And feel (companion of the dead)/ I'm living in the tombs.” While the film is somewhat innovative in its extensive use of flashback, its camera extravagancies are limited to a few brief dollies. What it offers in lieu of muscular filmmaking is an abundance of atmosphere, particularly in the simple, natural feel it displays for subsistence living on the fringes of civilization: the cluttered, smoky cabin with its lofted bed and the dinner table loaded with hunks of cornbread and corn mash, the family Bible and the few books with their pages marked by mold, hoarded like treasure. (The film is less at ease in the White House, save when it can turn the grounds into something out of Mark Twain, with Lincoln sons Tad and Willie frolicking in a convenient swimming hole.) While Griffith had more extras with him out in California, Chapin and his company have to their advantage the inimitable eastern woods, deep and damp and loamy, trees bare and spindly in winter and earth seen more than once under snow, to provide an approximation of both Lincoln’s middle-west and the battlefields of the terrible conflagration. Chapin himself is appropriately towering, lank and raw-boned, a kind of proto-Carradine type, playing up both Lincoln’s homeliness (he looks the part of the “damned long-armed ape,” as Stanton is said to have cursed him) and his folksy friendliness, a comic aside ever at the ready, his ubiquitous shawl made just as crucial a part of the costume as the famous stovepipe hat. It is, in the truest sense, the role of a lifetime, with Chapin, like his idol, cut down before his immense task could be completed, before he could shoot the scene at Ford’s Theatre that would have brought the drama to a close, and shut off Lincoln from his memories once and for all. The job would be carried out time and again by others—by Griffith, once more, in his penultimate film, Abraham Lincoln (1930), with Walter Huston as Abe; by John Ford in his The Prisoner of Shark Island (1936), whose Frank McGlynn, Sr. was an old hand at playing Lincoln, and had played Sec. Stanton in Chapin’s old Broadway production. 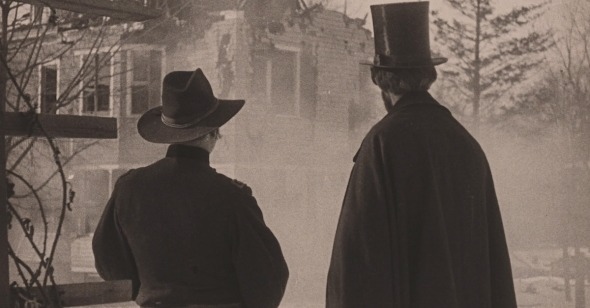 But for all the merits these films display, they do not have that feeling of proximity to the world of Lincoln that one gets in Chapin’s Cycle, which carries the scent of a lost Arcadia supposed to have existed somewhere out west, sometime before the wars. The Lincoln Cycle plays February 9 at Film Society of Lincoln Center as part of Film Comment Selects.